When I was sixteen the Regency Theater on the Upper West Side ran a Buster Keaton-Charlie Chaplin-Woody Allen revival for a few months. That was my introduction to Buster and it was love at first sight. 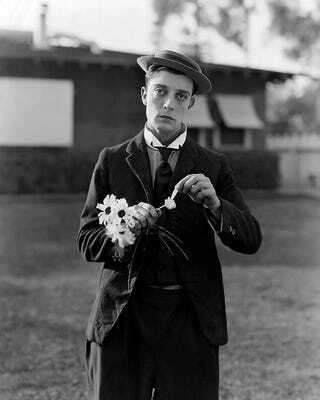 I adore Chaplin too but Buster speaks to me in a more direct, personal way. More than fifty years have passed since critics rediscovered Buster Keaton and pronounced him the most "modern" silent film clown, a title he hasn't shaken since. In his own day he was certainly famous but never commanded the wealth or popularity of Charlie Chaplin or Harold Lloyd, and he suffered most when talkies arrived. It may be that later stars like Cary Grant and Paul Newman and Harrison Ford have made us more susceptible to Keaton's model of offhand stoicism than his own audiences were. Seeking for his ghost is a fruitless business, though; for one thing, film comedy today has swung back toward the sappy, blatant slapstick that Keaton disdained. There's some "irony" in what Judd Apatow and Adam Sandler do, but it's irony that clamors to win the identification of the supposedly browbeaten everyman in every audience. Keaton took your average everyman and showed how majestically alone he was. Very early in his movie career friends asked him why he never smiled on the screen. He didn't he realzie he didn't. He had got the dead-pan habit in variety; on the screen he had merely been so hard at work it had never occured to him there was anything to smile about. Now he tried it just once and never again. He was by his whole style and nature so much the most "silent" of the silent comedians that even a smile was as deafeningly out of key as a yell. In a way his pictures are like a transcendent juggling act in which it seems that the whole universe is in exquisite flying motion and the one point of repose is the juggler's effortless, uninterested face.